14th ESA Conference 2019 in Manchester: Sociology Coming Home? Object of this empirical research is the working time flexibility in the retail sector and its consequences for workers’ everyday lives. Working on Sundays and on holidays and sometimes at night, up until only a few years ago was synonymous with factory assembly line work and “blue-collars”. Nowadays this is intertwined with the role of service workers. The idea of the research born from this question: how do these social actors experience and represent their time, how do they manage and balance their work and everyday life, with these de-structured working times and rhythms, in the age of liquidity, job precariousness and social acceleration. Globalisation has transformed commercial areas in very similar contexts, albeit in different cities and States. The same companies in the same global value chains have located their retail activities here: in the same shopping streets. Qualitative Case Study Methodology, with qualitative and ethnographic methods such as interviews and focus groups, has been used. Two European shopping streets in urban contexts, characterised by a post-Fordist economy, were chosen as case studies: Corso Buenos Aires in Milan and Oxford Street in London. During six months of ethnographic observation in each context comprehensively 50 interviews and 2 focus groups were carried out. In Italian shops, sales assistants work often six days per week, on Sundays and holidays. In Italy, with the application of the “Salva-Italia” Decree, shop opening hours have been fully liberalised since 2012. This (de)regulation prescribed the possibility of 24/7 opening: 7 days per week and 24 hours per day, which means “always open” (some international brand supermarkets started, in this period, to be open 24/7, even in very small villages). There have been several debates, by trade unions as well as local and small entrepreneurs. 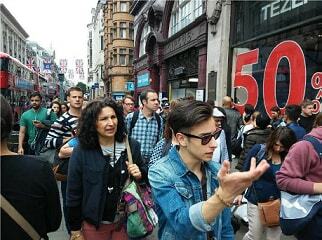 In London, sale assistants work 5 days per week and are more often young, with fewer “temporal needs”. Workers claim a regulation of opening hours, to share time with their families, friends, children and communities. Male and above all female workers perceive a condition of “time alienation”, being in a situation of “time inequalities”. The sales assistants’ everyday lives are deeply influenced by working time flexibility. This research allows reflection on the dialectic between consumption and work, between a hypothetical right to buy-consume 24/7 and the workers’ right to the time, to plan the future and protect their life. These workers have no power over their own time. The processes of deregulation, commodification and de-structuration of time are synthesised by the author in the “immediatisation” process, to underline the demand for instant gratification by customers, who want everything now. In urban contexts and metropolitan cities, a new model of society, with de-structured working/consumption times, is being set up: the “24/7 service society”, where the customer must be able to buy at any time, at the expense of workers’ time.